I'm here on behalf of my clan, The Dark Brotherhood (TDB) to look for some new members to join us! We've been around for over 6 years now, playing with some of the biggest youtubers, building cities, having fun and have gathered over 990 pages on the Minecraft Forums - thread here. Right now we're playing on a fantastic server called RenMX. We've been here for a while and have become very well established with members both from PMC and the Minecraft Forums. We're looking for new people to join us in our town and discord chat and help us expand more. To join follow these instructions! - Firstly, you must join our discord channel, click here to join. - When you join, the TDB BOT will give you an empty application in the recruitment channel. - Fill in this application and wait to be accepted. While you wait you can talk in our public chat channel for everyone! - Once accepted you'll be a full member of the clan and will be allowed to join our group chat. Welcome to the clan! Thanks for your interest in joining our clan! 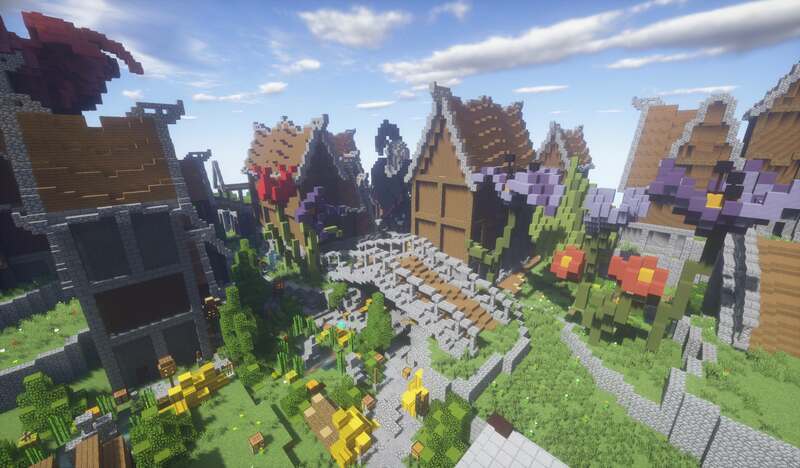 As a clan we talk and play together, taking part in creating our town and playing adventure maps and embarking on projects together. We're looking forward to seeing you around! Video removed - making a better one now! I love the recent works on the docks, we're looking to be making more ships! Join our discord today if you want to have a look! We're planning an upcoming video series, come along and join it! Loving the work on the town and the talk of the upcoming mural! Awesome time to join the clan, the town is looking better than ever! So much new space to build on, come along and join the clan today! Here's a picture of Josh's work in progress build! Big shout out to Jona for his Zelda inspired forest creation. Come and have a look by joining now! WAY more land freed up! There’s plenty of space in the town to build houses and whatever you want, now is the perfect time to join us! New park finally completed! Halloween celebrations over! Come online now! Jona’s new tavern is looking great! Check it out, join the clan today! New park is looking fantastic, members are building paths to the new area now! Construction on the new park is nearly complete! Work on the castle is nearly complete, just a few rooms left! The Valley challenge is still unbeaten! Think you can do it? Come along and try it today! I love the progress being made in the Viking area of town, come along and help us build it today! Freed up plenty more space for you to create houses, come and join today! Come along and join the clan today! Our Viking town, Brothersgarde, is looking fantastic! Come join today and explore! A huge congratulations to the clan for reaching 1000 pages on the Minecraft Forums! Our town is expanding both behind the grand tower and into the dark forest! Loving the different styles of building all coming together. Apply now and be part of our town! Working on the castle interiors with the clan today, it's amazing seeing everyone working together on such a big build! We've been hard at work on a massive castle, an impressive sight right by our town's spawn. Come along and help us finish the big team build! Great to see people from PMC joining us on our discord! We're looking forward to seeing new people in our chats! Come along and join our discord channel!